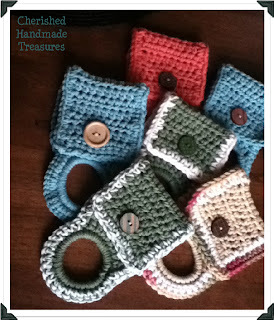 I love receiving these cute bloggy awards! 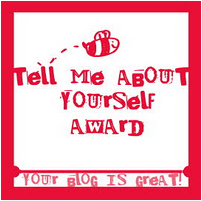 Pinkoddy's Blog: My Thoughts and Knowledge passed along the Tell Me About Yourself Award to me and several other bloggers a while back (I'm ashamed to admit how long ago). The reason it has taken me so long to post is because I have a difficult time revealing things about myself. However, I want to say "Thank you SO MUCH! ", and encourage everyone to please stop by and visit her blog. It was very sweet of her to recognize me. I must tell 7 things about myself (although I'm seriously running out of things to tell), and I must pass it on to 15 other bloggers. I'm fairly organized,except when it comes to my artistic side--chaos reins. I'm forever making lists. My life revolves around them. If it's not written down, it doesn't get done. I love when I have the house to myself and I can work in quiet solitude, no background noise at all. Like Homer Simpson, I can't pass up a doughnut even if it meant it would save my life! I'm an early riser, but the older I get, the less I seem to get done--regardless of how early I get up. My mind goes in a thousand directions. Like most of you, I live love to blog. 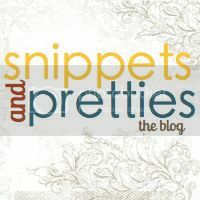 15 other deserving bloggers--please take a moment and visit all of these wonderful blogs! Please vote for my blog on Picket Fence Blogs! Thank you so much for the award (you're awesome!). Thank you so much for the award! This is awesome and I look forward to participating too! Thanks for the award! You have such a cute blog!